Part 1: Vibrational Spectra of Organic Crystals and Their Interpretation by Means of Atom-Atom Potentials. Dynamics of the Molecular Crystal Lattice. Theory of harmonic vibrations of molecules in crystals. Symmetrical properties of force constants and dynamical matrix. Intermolecular interactions and atom-atom potentials. Typical cases of disorder in molecular crystals and their representation in vibrational spectra. Calculation of Frequencies and Normal Vibrational Forms in the Approximation of Rigid Molecules. Calculation technique for the lattice dynamics of molecular crystals by means of AAP. Choice of the AAP parameters for the calculation of the external vibrational frequencies of molecular crystals. Temperature dependence of external vibrational frequencies. Model of independent anharmonic oscillators. Solution of the Dynamical Problem with the Consideration of the Intermolecular Vibration. Display of the intermolecular interaction in molecular spectra of crystals. Interaction between the internal and external vibrations. Calculation of the low-frequency spectra of crystals with the conformationally unstable molecules. Half-rigid molecular approximation. Devices and Methods for the Experimental Investigation of Organic Crystals by Means of the Vibrational Spectra. Measurement technique for molecular crystals in the far infrared region. The technique of sample preparation and methods of the investigation of Raman spectra of organic crystals. Modified model of the oriented gas for the calculation of the relative line intensities of the low-frequency Raman spectra of the molecular crystals. References-Part 1. Part 2 Investigation of the Structure, Phase Transitions and Reorientation Motion of Molecules in Organic Crystals. Vibrational Spectra and Phase Transitions in Plastic Crystals. Investigation of the phase transition in cyclohexane and deuterocyclohexane crystals with the help of vibrational spectra. Anisotropy of the rotational reorientations of molecules in the crystals of cyclopentane and thiophene. Statistical model of orientational phase transitions in plastic organic crystals with the consideration of the rotational reorientation anisotropy. Reorientational Motion of Molecules in Crystals Without Mesophases. Premelting effects in naphthalene crystal. The Raman spectra of benzene crystals. The temperature dependence of spectra in the vicinity of the melting point. Conditions of the display of the reorientational motion in low-frequency raman spectra of crystals. Stationary Orientational Disorder in Trihalogen Substituted Methane Crystals. Vibrational spectra and structure of crystals of bromoform and iodoform. Disordering of the chloroform crystal structure in the vicinity of the phase transition to the liquid state. Vibrational Spectra and Phase Transition in Crystals with Conformationally Unstable Molecules. Distortion of the plane conformation of biphenyl crystal molecules in the vicinity of the melting point. Low-frequency vibrations of methyl groups in organic crystals. Application of vibrational spectra and AAP for the Determination of Structures and the Investigation of Phase Transitions in Crystals of Phenanthrene and Pyrene. Investigation of the phase transition in phenanthrene crystal by means of low-frequency Raman spectra. Calculation of the molecular packing, the low-frequency vibrational spectrum and their changes at the phase transition in pyrene crystal. References-Part II. APPENDIX I. AAP Parameters used for the calculation of the lattice dynamics of molecular crystals. APPENDIX II. Computerized calculations of the frequencies and eigenvectors of the normal vibrations. APPENDIX III. Frequencies and eigenvectors for the low-frequency normal vibrations of several organic crystals. Subject Index. 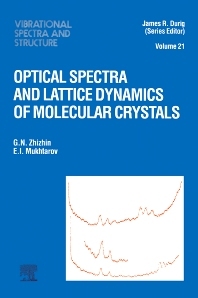 The current volume is a single topic volume on the optical spectra and lattice dynamics of molecular crystals. The book is divided into two parts. Part I covers both the theoretical and experimental investigations of organic crystals. Part II deals with the investigation of the structure, phase transitions and reorientational motion of molecules in organic crystals. In addition appendices are given which provide the parameters for the calculation of the lattice dynamics of molecular crystals, procedures for the calculation of frequency eigenvectors of utilizing computers, and the frequencies and eigenvectors of lattice modes for several organic crystals. Quite a large amount of Russian literature is cited, some of which has previously not been available to scientists in the West.